I’m sitting outside. It’s about 9:00 pm on Saturday night. A plastic cup of cheap wine by my side. The old boom box radio sings to me from just outside the barn. “Grassroots”, a bluegrass and roots music program is playing on NPR. We listen to it almost every Saturday night and again on Sunday mornings. A warm fire is burning in the firepit. Nothing out of the ordinary except the usual heat of your average summer night has been pushed out by a cold spell. The temperature is in the 50’s and I sit here in long pants, a sweatshirt and stare beyond the fire to our apple tree, full of small yellow apples. I imagine the tree is wondering if it has somehow fallen behind and missed its growth season. I’m happy to see apples though, as the last two years have been very sparse. 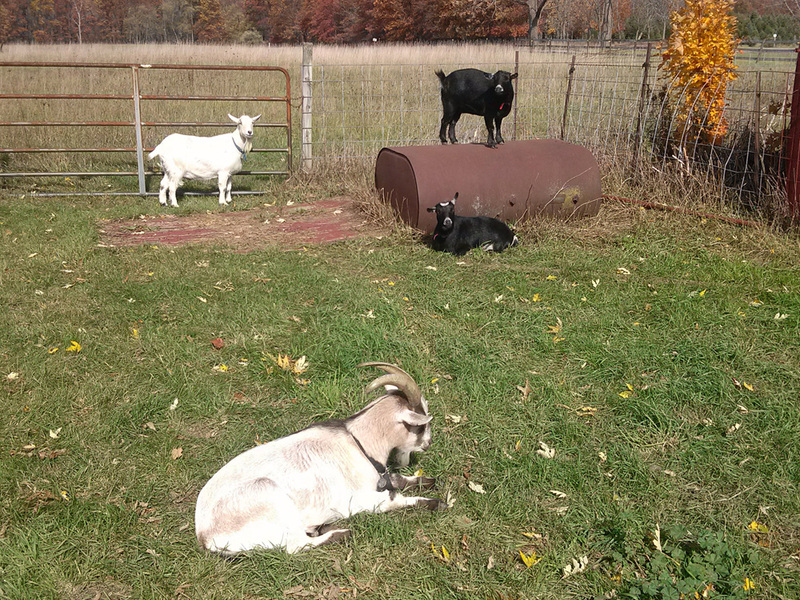 Three of my four goats are grazing away, happy to have some human companionship outside but on this occasion not hovering around looking for their heads to be scratched. 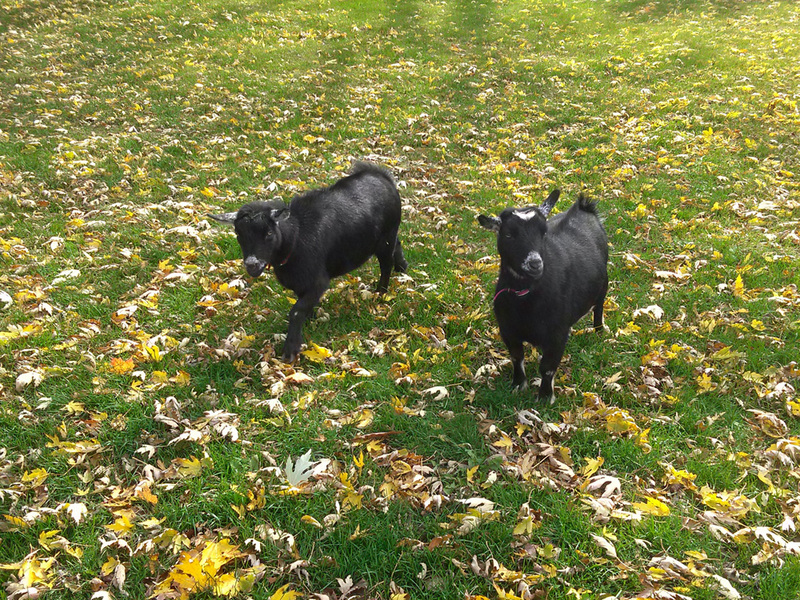 Goats are extraordinarily affectionate creatures and it occurred to me today that I could never have imagined “farm animals” bringing me so much joy. 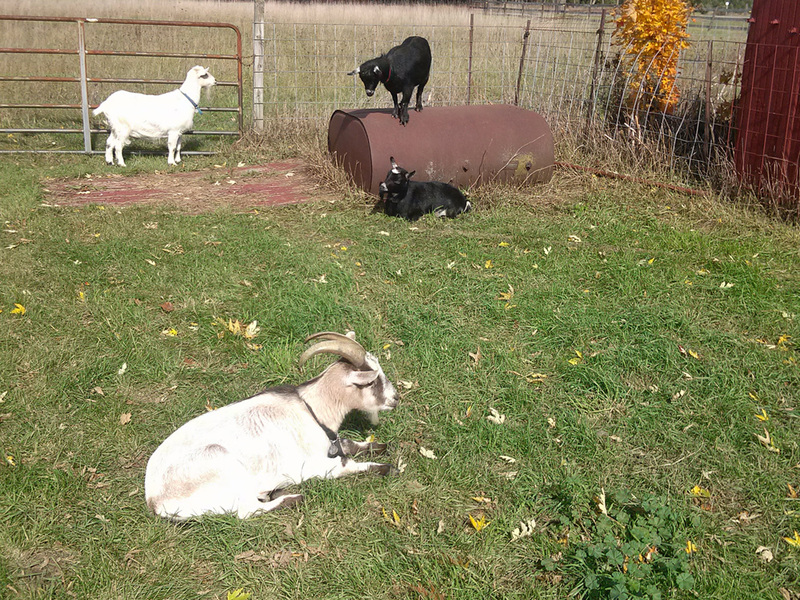 Goat number four, Heath, is inside their barn. He is getting old and doesn’t get out as much as he used to. Like any animal, none of them will live forever and that thought saddens me, yet I am grounded knowing that we are providing them a comfortable lifestyle. The corn field across Brown Road is being irrigated. I was annoyed this morning when the farm equipment woke me up, but now I’m soothed hearing the sound of water soaking the stalks. I hear the fsh, fsh, fsh, fsh, as the gigantic, prehistoric looking irrgation sprinkler fires out spray after spray of water, as if it is trying to keep beat with the upright bass that anchors the latest bluegrass tune on the radio. Jonathan is inside. The girls tonight, out of town at a softball tournament. It seems like that’s the stage of life we are in, with something going on every weekend. “Divide and conquer” we like to say. You go here, I’ll go there and both kids will be happy having a parent around. He’ll come out soon enough though and we’ll cook hobo pies on the fire before calling it quits for the night. Though the girls are away, I’m happy to be home. It’s peaceful tonight, a little rare, quiet, alone time. I worked around the yard a lot today, until my 45 year old back told me enough was enough. There’s something about physical work though that is rewarding. Sometimes I think it’s what we were supposed to do, before technology took it all away. In contrast, I sit here and type on an iPad and wonder what I would do without it. The bright screen, the fire and the two security lights the only thing interrupting the total blackness of the night. Soon the bats will be out, circling the lights and getting their fill of insects. Later tonight the coyotes will stand around in a circle, far away, but close enough that we’ll hear them howl and laugh as if celebrating a reunion of old friends. It’s dark now and everything around me has become a scene of outlines and shadows. The radio seems louder as if somehow it is disturbing the night solitude. But there’s nothing to disturb here, no one around, just me and the goats and the bats and lots of crickets and likely lots of other wildlife that I can’t see or hear. The fire is dying now, so I will go put more wood on. Because this may be just a moment in time. But if I have any say in the matter, I’d like it to last just a little bit longer. The latest addition to the Brown Road family! 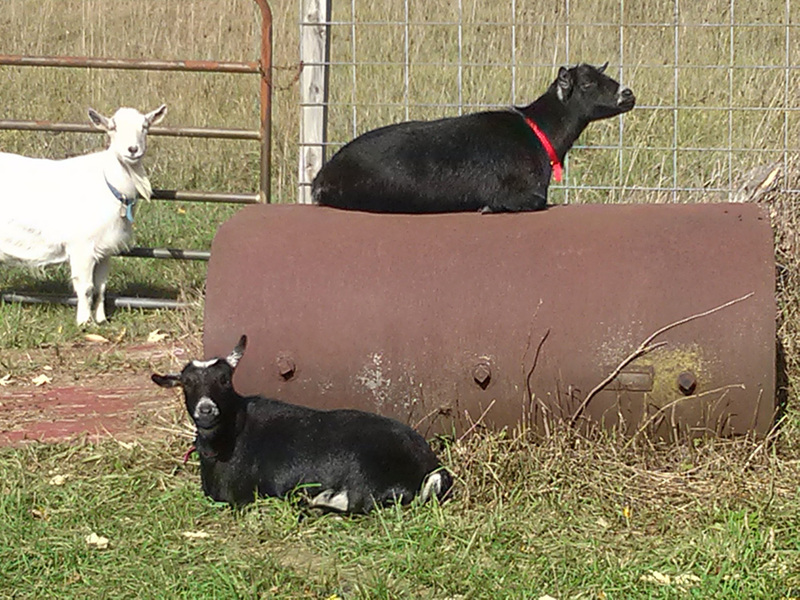 These are pygmy goats that we adopted from some 4-H’ers that weren’t able to keep them. They’re the cutest damn things! Holly is all black, Ella is the one with the white hat. Guess I’m gonna have to design some new t-shirts…. The State of Michigan tourism department, “Pure Michigan”, has for several years been running a highly successful and award-winning radio advertising campaign promoting all of the wonderful places that people can visit in the state. The voice-over artist is Tim Allen, of television and film fame, who was a long-time Michigan resident. So after hearing these radio ads over and over again, I thought, what better way to get more readers than to produce a radio ad promoting my own blog, The Brown Road Chronicles. I’ve been working very hard on this, please take a listen, it’s hosted on Sound Cloud, hope the link works. Maybe soon you’ll hear this on a radio station near you! O’ Beautiful Corn, you grow so high. Up to our knees by Fourth of July. Up to our chest in August late. Just in time for harvest date. O’ Beautiful Corn, grown from the lands. We buy you from the local stands. A dozen ears won’t cost a lot. Shall be enough to fill our pot. O’ Beautiful Corn, in husks of green. We peel them to reveal your sheen. A job, our children we employ. One of the jobs they do enjoy. O’ Beautiful Corn, you precious food. You always put me in the mood. For friends and fun and barbeques. And summer meals we can’t refuse. O’ Beautiful Corn of shining Maize. Your fresh picked taste on summer days. Soaked in butter, sprinkled with salt. Your goodness we should all exalt. O’ Beautiful Corn, your cobs we strip. With our teeth we tear and rip. That’s how it’s done at any age. But Beautiful Corn, we must confess. even the pilgrims way back when. See, Beautiful Corn, we are distressed. Why your kernels, we cannot digest. Every other food we turn to poo. Why can’t we do the same with you?